Zanola Company is so excited to co-host a discovery charrette for the city of Mt. Vernon, Illinois! Mt. Vernon’s historic homes communicate a sense of community, family, and valued traditions. The Mt. Vernon Strategic Housing Program recognizes its beautiful architecture as important to link the past with the future. We hope to plan many new homes with exteriors that reflect Mt. Vernon’s history, improved with updated, what-people-want-now interiors. We'd like to invite you to a hands-on workshop exploring the future of architecture in Mt. Vernon homes. Led by Tim Busse, town architect for New Town in St. Charles, Missouri, a neighborhood inspired by extensive research in classic role model homes in St. Charles, St. Louis, and other historic areas. The workshop, to be held on July 17 at 10 a.m., will introduce the vision of homebuilding in the heart of Mt. Vernon and Busse’s story of designing homes for New Town. Following the introductions, attendees will go on a Mt. Vernon Role Model Homes tour that showcases the historic home designs that will set the tone for Mt. Vernon’s future new homes. This workshop is a great opportunity for local planners, architects, developers, homebuilders, and more to participate in Mt. Vernon’s planning process and make the vision for Mt. Vernon’s new homes come to life. We hope you will join us! 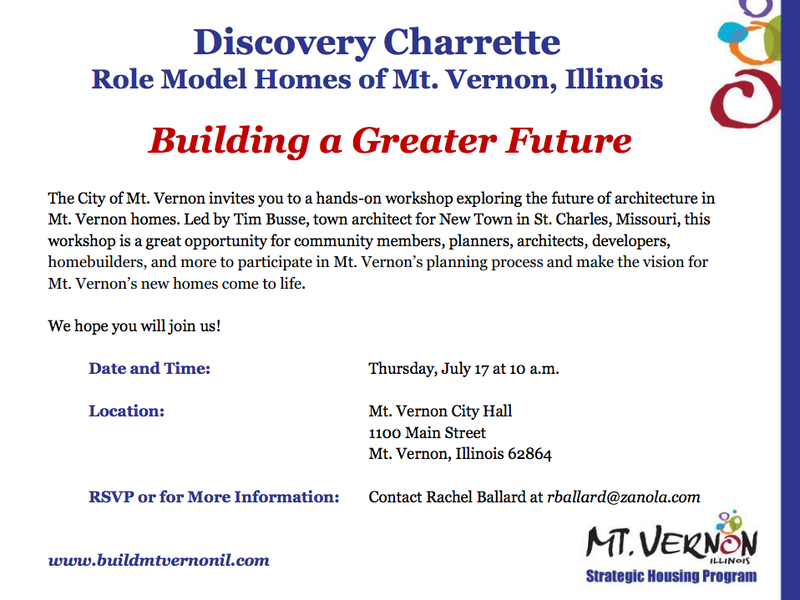 Visit charrette web page to RSVP or for more information.